Located in Morganton, Ga, Private and secluded and quiet getaway in the north Georgia mountains. Located within walking distance of Kingdom #1! Exhibiting exceptional decor, this cabin is an ideal getaway retreat. With 3 bedrooms, 2 baths and sleeper sofa, this cabin suits most family needs. The amenities include a calming spa, two balcony front porches beholding our beautiful mountains, charming fireplace, SAT TV with VCR and DVD capability. With two floors providing both a living room and a family room, most family sizes are accommodated. 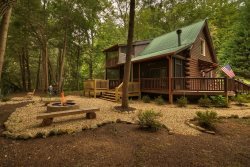 This cabin is totally secluded, has a large fire pit, and the soothing sounds of the creek can be heard from the hot tub, porch, and balcony. The kitchen is fully equipped for preparing all your favorite meals. Nearby attractions include hiking the beautiful trails of North Georgia, biking, Antique Shopping, White Water Rafting, Horseback Riding, Scenic Train Rides and the famous Swan Drive In. All of our cabins include linens, dishes, pots, pans, towels, washcloths, etc... We will provide an initial supply of guest soaps, toilet paper, dishwasher detergent, paper towels and trash bags. We suggest that you bring your supplies for an extended stay of paper towels, trash bags, starter logs for wood burning fireplaces and washing powders. Awesome cabin!! We loved the fact that it is kind of off to itself and private away from the hustle and bustle of life. Excellent view of the creek and the stars are amazing at night!! Overall we had an enjoyable experience! THe cabin was exactly as the photos. Spacing for our family was great! We would love to return here for another visit!! Its nice and quiet and an easy drive into Blue Ridge but its very hard to find at night with the given directions, two of the bedrooms are down stairs and the stairs are rather steep, this wasnt a problem for us but it could be for those with kids or mobility issues. We had a fantastic time at the cabin, it is secluded and beautiful. It is also within 15 minutes of town for any grocery needs. Beautiful hikes nearby!! The staff rocks! Every time weve used them theyve been awesome- and the first time we rented from them I had 2million questions but not all at once so I had to keep calling back with my latest question and they never got annoyed with me - or at least hid it very well lol!!! We came here for a quick little quiet weekend getaway with our family of 4. It was perfect! Very spacious and clean. Quiet and peaceful but not far from good restaurants and family fun!! We will be back. Incredibly happy with our service! A few maintenance issues arose and they fixed things promptly and nicely. Anytime we had any questions they were always there to answer the phone. Cabin was very clean and well kept. Would absolutely recommend to friends and family and well definitely come back again! Our family needed a getaway. We have 6 children one with very special needs. This place was a perfect choice for our Florida family. We have been 2 times and will be returning!! Being in this cabin was such a wonderful experience. It's a little slice of Georgia heaven, and we didn't want to leave! The surrounding area was gorgeous, and our pets loved the woods! Our stay here has been nothing but amazing! Everything about this cabin is extra cozy, comfortable and has everything we need. THis was our second year here and we cannot wait to come back for our third!! Our stay was very tranquil and peaceful! We enjoyed every minute. Thank you for the opportunity to stay here- We will see you next year! The team members were extremely helpful and so nice! My husband and I enjoyed our romantic getaway in Kingdom Cabin 2. It was secluded, quiet, clean & the decor was so adorable! I loved the "home" feeling I got when walking inside. I would highly recommend this place & because it is so affordable,I look forward to coming back again soon. EVERYthing was wonderful! We enjoyed the beautiful cabin and scenery. The weather was very pleasant. The cabin was very clean and well maintained. The only thing we hated was that we had to leave and come home! Excellent cabin, would definitely rent again. AC worked perfectly in the summer heat and the hot tub was a treat! The cabin is secluded and peaceful overall we enjoyed our stay. Staff was all very friendly and courteous. We really enjoyed our stay! We only stayed a weekend and we were definitely not ready to leave. We had 5 kids and 2 dogs with us, and they were just able to run without worrying about cars or disturbing neighbors. It was very peaceful and relaxing. We are already talking about coming back for another visit. Thank you very much! Beautiful, peaceful, quiet, comfortably cozy. Loved the hot tub! Before our stay, I would call with questions and the phones were answered by a person that would answer the question immediately each time. Very friendly, helpful staff. It was so quiet and everything I was looking for in a relaxing vacation. We had no cell phone service so we were totally off the grid which insured we interacted with each other instead of constantly on our phones. It was a exactly the peaceful vacation we were looking for. We were there on 10-21-16 to 10-23-16 for a girls weekend ages 32-54. 5 of us this will be our 5th year going by far it was the best Great Cabin very clean avert thing we needed was there I will definitely book again!!!! We really enjoyed our stay! We were looking for a stress-free weekend getaway, and your cabin delivered! Everything was clean and ready for us, and the hot tub was awesome! We will be back for sure! We had a truly wonderful stay with the Mountain Laurel Cabins. We were able to make wonderful family memories here. The secluded nature of the property nestled in such a beautiful area made drinking my morning coffee on the balcony a real treat. The house had everything we needed and then some! A wonderful hot tub along with plenty of games and a fire pit. What a wonderful time we had, thanks for the memories. Very private,clean and everything worked great.